In autumn 2017, we unveiled our latest creation: a larger-than-life sculpture of the legendary King Midas. Following in the very large footsteps of our world famous Spoon Gorilla and thought-provoking Knife Angel, King Midas was also featured on the BBC and in national newspapers. King Midas is a regular exhibit here at Black Country Metalworks and is on display in our indoor Showroom. If you would like to see if he is on display before you visit us, please call 0800 6888 386. Entry to our centre is free and you can also book a priority pass before you visit. We wanted to make sure we were not breaking any rules by using real coins for the sculpture. So, before work started, we contacted the Royal Mint who confirmed as long as no coins were damaged or defaced in the making of the sculpture we were fine to go ahead. 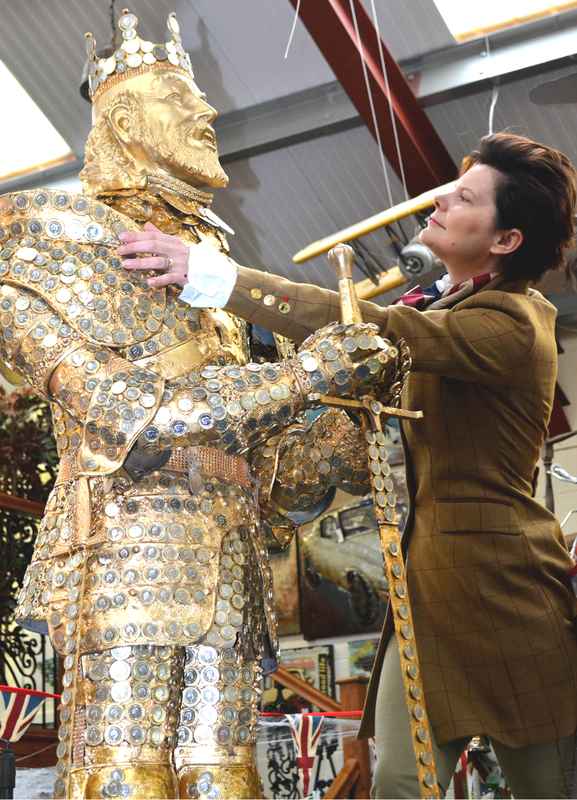 Chairman Clive Knowles commissioned Debbie Rees Deacon, a theatrical designer and set maker, to create the golden king. “It is the most unusual and most costly singular object I have worked on to date,” Debbie said. Debbie, originally from Wrexham, hoped the statue would inspire people to think about the real value of money and how it can be both a blessing and a curse. The myth of the "Midas Touch" is the story of a foolish king who wanted to be the richest man in the world. King Midas was granted a wish by the Gods and his wish was for everything he touched to turn to gold. At first, he was thrilled by his good fortune. But his happiness soon turned to despair when he realised the consequences of his wish. King Midas could not eat or drink because he turned his food and wine to gold. Then he accidentally turned his beloved daughter into gold too. King Midas begged the Gods to lift the curse. Luckily for him, they took pity on the king and he and his daughter were returned to normal. Through his greed, King Midas lost the things that were really important to him. A timeless and cautionary tale!